As we walk that downward dog, we might recall that it was on this date in 1891 that Swami Vivekananda reached Bombay on a two year pilgrimage. A Hindu monk and chief disciple of the 19th-century Indian mystic Ramakrishna, Vivekananda announced his plans to go abroad. 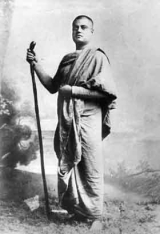 In 1893, he sailed for Chicago, where he began a tour on which he was a key figure in the introduction of the Indian philosophies of Vedanta and Yoga to the Western world.